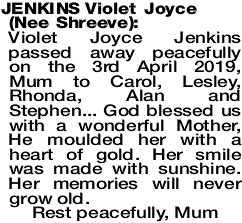 Violet Joyce Jenkins passed away peacefully on the 3rd April 2019, Mum to Carol, Lesley, Rhonda, Alan and Stephen... God blessed us with a wonderful Mother, He moulded her with a heart of gold. Her smile was made with sunshine. Her memories will never grow old. The Funeral Cortege for Mrs Violet Joyce Jenkins of Rockingham will arrive at the main entrance of FREMANTLE Cemetery, Carrington Street, Palmyra at 12:00pm on THURSDAY (11.4.2019) for a Cremation Service in the West Chapel.